As reported on the EBB a month ago, the Niall Toner Band (IRL) reached the #1 download spot on the bluegrass and folk charts for Air Play Direct during March 2011, an exceptional achievement for artists based outside the USA. Mountain Music Entertainment, who represent the Niall Toner Band in the USA, announce that as a result the band have been getting ever-increasing air play on US radio. 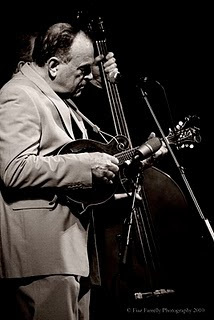 Niall's songs about the Father of Bluegrass Music are naturally going down well in 2011, the centenary of Bill Monroe's birth. Following up this success, in late April/early May Niall will be visiting Nashville, TN, and North Carolina. He will perform a few solo shows in Asheville, NC, before heading to MerleFest, where he will conduct interviews with as many stars of roots and bluegrass music as possible, for broadcasting on his Roots Freeway radio show on the Irish national station RTE Radio One during June and July this year.